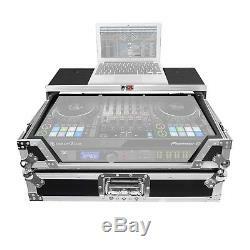 ProX XS-DDJ1000WLT Pioneer DDJ-1000 DJ Controller Flight Case w/ Laptop Shelf. The ProX XS-DDJ1000WLT Digital DJ Controller case fits the Pioneer DDJ1000 controller, and is made with the highest quality material and workmanship. If you have a passion for your gear and want to keep it safe at all times, this case will perform at the highest level. The XS-DDJ1000WLT fitted for the Pioneer DDJ1000 is constructed with a rugged signature 3/8 Gig-Ready Series Plywood with honeycomb style, durable rubber wheels, reinforced steel ball corners, as well as recessed steel padded handles and latches. There is additional space for cables and small accessories in the back and underneath the unit for convenience. The front removable panel allows you to access the front input jacks easily, and also allows access to the front controls and headphone/mic jacks. This ProX Digital Media controller case is manufactured with super-sleek look of the honey comb hexagon laminated surface design on all shell surfaces, which gives the case an almost alien look. Also, as opposed to regular laminated plywood cases from other manufacturers, the ProX honey comb design helps to prevent minor to mild scratches. 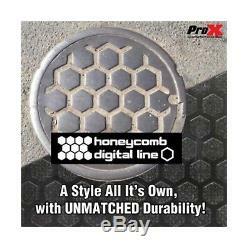 The honey comb digital line design was inspired by New York City's street manhole covers, which are made to handle rough and tough everyday punishment. ProX Goes Green: The durable, hard rubber foams used in ProX cases contain 70% recycled content. Of that 70%, 80% of it comes from recycled plastic bottles and the remaining 20% from recycled post-industrial material. At ProX, they strive to make the world a better place. 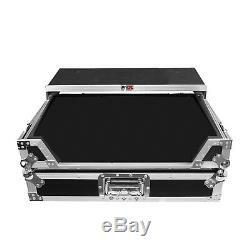 ProX XS-DDJ1000WLT Pioneer DDJ1000 Digital Controller Flight Case Features. ATA-300 Style Gig Ready Flight Road Case. Easy locking fit and tongue. High-density foam interior support & casing. Recessed spring action Handles per Side. Heavy and powerful steel ball corners. Signature Series Laminated 3/8 plywood. Industrial Recessed butterfly twist lock latches that can be padlocked. Cable access hole with removable emblem cover. Each XS-DDJ1000WLT Retail Box Includes: (1) ProX XS-DDJ1000WLT Pioneer DDJ1000 Digital Controller Flight Case with Laptop Shelf & Wheels. Two Retail Locations &###x2022; One Massive Warehouse &###x2022; Thousands of Items in Stock &###x2022; Fast Free U. &###xA9; 2017 I DJ NOW. Any use of this material including all content, images and design, without prior written consent from IDJNOW, is strictly prohibited by law. This listing is currently undergoing maintenance, we apologise for any inconvenience caused. The item "ProX XS-DDJ1000WLT Pioneer DDJ-1000 DJ Controller Flight Case with Laptop Shelf" is in sale since Wednesday, June 6, 2018.